I did some needle felting therapy last year. It was exactly what I needed at a time when I couldn't bring myself to leave the house. My chair in front of the TV was the safest place in the world! I even went months where I just couldn't go down stairs to my studio! Needle felting is the perfect portable craft! It's a forgiving medium that you really can't screw up. You can add more wool, or take some away and work it until you decide it's done. It can be very Zen. It is certainly healing! I set a goal with my therapist to accomplish one project each month to keep me from going down the rabbit hole. 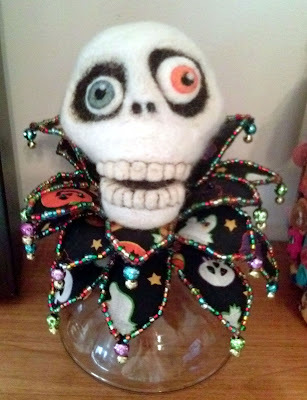 I decided they would be Halloween themed, because, well, to paraphrase Tim Burton - Every day is Halloween for some us! 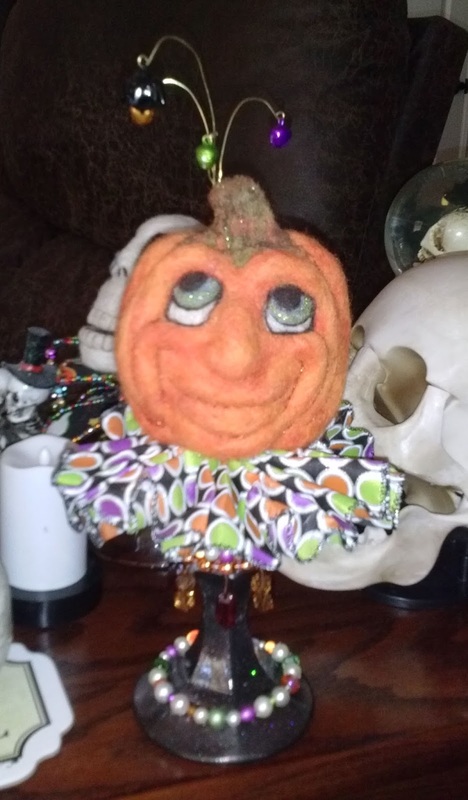 I took an online class to learn needle felting some years ago and this Pumpkin guy was the project. I pulled him out to do an upcycle project. There are so many inspiring projects like this on Pinterest! I used a candlestick holder. wired ribbon and beads. Whimsy and color feed my soul, so I continued felting and upcycling and made this skully guy. He sits on an overturned candy dish looking gloriously silly. This wasn't wired ribbon, so I glued wire, covered with felt, on the back to help me shape it. I love beading, too! More color and more shine - What's not to love! I hope that if you 're suffering in some way, you will try some creative therapy! It really works! LOVE this Candace! I'm taking a felting class next month. I hope that it will be a good therapy for me too! I think you'll find it very soothing, Dear Friend! I hope you'll share photos!